They create an opportunity to grow, to connect with others, to practice, to excel, and to enjoy the game from the young to the old. Playgrounds are a place for people to express their talents in a freeing setting, with no rules and no boundaries when playing their favorite sport. Streetball allows for players from the professionals to the amateurs to share their love of basketball on the same playing field. On June 10th the International Olympic Committee announced the addition of streetball, 3×3, to the 2020 Olympic games in Tokyo, Japan. I spoke with Sara Toccafondi; coach, trainer, and player for Pallacanestro Femminile Firenze to discuss the culture of streetball in Florence and the possible effects the addition of this form of play will have on the culture of basketball in Italy. Attempting to delve into Florence, a city driven by football, I wanted to know how basketball is emerging in the local parks and how it has been a constant avenue for people to learn more about the sport. Pick-up games of 3×3 or 4×4 create an opportunity to meet new individuals passionate about the sport, practice new tricks, and develop new skills without the pressure of the technicality and rules that dominate basketball in a professional setting. Half court games are a simple way to explain basketball, express talent, train yourself, and try new things. You can find games that require a high level of skill or games that do not, you can come with friends, or you can join a game on your own. It is possible to find a good play when going to the park. If you were interested in joining a game in Florence, there are some tips to follow. 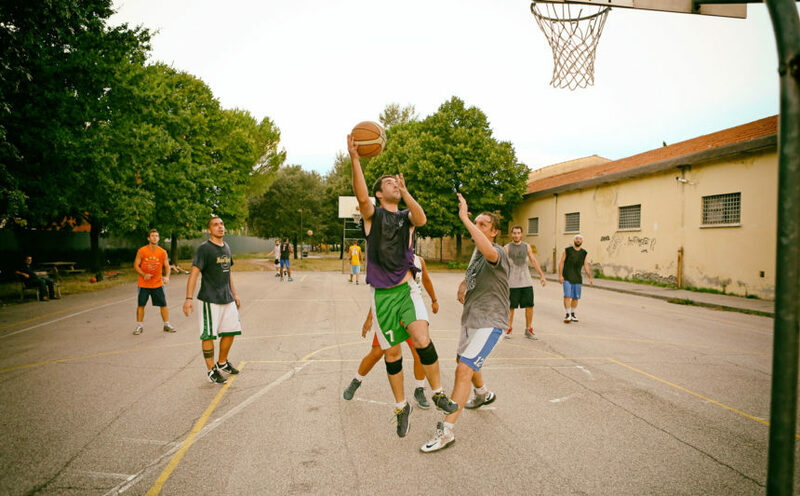 There are only a few courts throughout the city which include the South of Florence, Caserma Park, or Cascine Park, where you can find a number of pick-up games. There are some unwritten rules to the game, but a lot of it depends on the players. If there is a 4×4 game, you can bring a team to play against, or you can ask to play another person’s team and wait your turn. There are no referees in a pick-up game so you call your own fouls, double dribbles, and travels. Twenty-one points till the game is finished and 3’s are considered 2 pointers, while 2 point shots now count for one. Players often play to win by a 2-point margin. There are no free throws, but you bring the ball in play to continue the game. It doesn’t matter how you dress; if you have the freshest Jordan’s on or flip flops, as long as you can hold your own and love the game you can play on the court. If the game were to enter the Olympics, I wandered how that might affect the streetball community. Would more people be trying to prove themselves on the court? Would the integrity and free nature of the game be comprised? Ten years ago, more technical skills were important rather than the physical nature of the game. But 3×3 depends on both talent and the physical nature to be played. Sara expressed that with the addition to the Olympic games there might be more of an opportunity for Italians to be spectators of the basketball, see how fun the sport can be, learn about it in a simpler setting, and create a way for people to get closer to the game. The International Olympic Committee has recognized streetball for the fun and expression of talent the game can bring. Hopefully, Italy will see the same and be present in the 2020 games to show the amazing qualities streetball has to offer and the love of streetball in Florence will continue to thrive.